So on the day of the recent Mod Pop photo shoot, hubby and I were actually out and about Christmas shopping. And as usually happens, I came across something I didn't even know I needed! 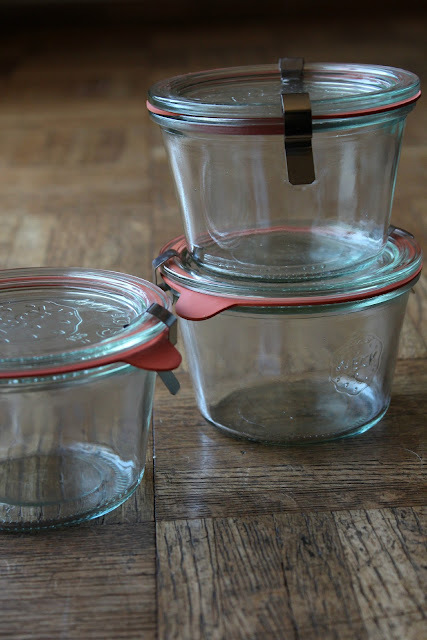 This time it was some really cool Weck canning jars. And no worries, I know exactly what I want to put in them. Salty Caramel Sauce from Jen of BettyCrockerAss. I've heard raves on blogs and on Instagram, and I'm thinking I really need to try it. Soon. Obviously, having purchased six of these jars, I'll most likely be giving some awesome sauce away. I really like the idea of giving gifts of food. Unfortunately I think about it more than I actually do it, but it's only December 4, so I'm still in that hopeful mode. Some things I've enjoyed giving in the past are homemade kuchen, spiced nuts, toffee, biscotti, liqueur, and even peppermint marshmallows . . . Do you give foodie gifts? Please tell us about your own hopeful plans! Shortbread is a popular gift in my house! I'll definitely be making some for giving this year! And I'll be linking up...soon, I hope! Those are beautiful jars, I have never seen anything like them. I have a lot of jam this year so I expect that everyone will get some, but food is not normally my go to gift. Perhaps I should revisit that as people I buy for are getting to the point where they have everything they need. Ouuu, I just saw these online this week too! Aren't they marvelous?!! I must find some in real life (or order some)!! love the jars. wish I had had them this summer when I was making jam. I usually give cinnamon bread to everyone in the office. even if they don't like it, my house smells divine! I really like those jars - I have never seen those before! I have given jam, cookies, chocolate covered pretzels (those are popular) and, one year I made swirled pink peppermint marshmallows and packaged them with hot chocolate as gifts for all of our admin assistants. I was surprised how easy it was to make my own marshmallows. This year, I am working on ice cream toppings - I have a daughter who absolutely loves ice cream! Probably no foodie gifts this year, but every other year I do usually give some, usually cookies or something canned. Those canning jars you found are awesome! Cute jars! I need to find those for my brown sugar scrub. I just got a recipe for peppermint foot scrub. You could eat them both I suppose, but I would not recommend it. Foodie gifts I used to make were homemade suckers and salt water taffy, until my thermometer broke. I still have not replaced it. :) I should probably do that since I have plans to steal a large portion of my mom's sucker molds while in Utah. I wish I had found those the other day when I went looking for jars. They are to cute and just the right size. Those jars are so cute! I have a very old recipe for trash (it uses doo-dads if that gives you any indication!) and it's a requested item every Christmas. I enjoy making cut-out cookies as gifts simply because it seems to be a lost art now. However, I must admit that one day I made a triple batch for our youth department (decorated and everything ) and then realized that they were all gone (crumbs and all) in five minutes -- well, it did make me stop and think! Very cool! Although I'd probably feel the need to visit whoever I'd donated the food to to claim the jars back afterwards ;o) Have fun! I'm hoping to can some apple pie filling and some honey vanilla pears. Oh, and about 5 dozen Christmas cookies for hubby to share at work. I know where you can send some of that sauce! I like to gift bark - so easy to make a bunch of varieties! Congrats on your do good stitches prize! Delightful little jars. Awesome Sauce - sounds good. I really love making shortbread and gingerbread biscuits to share. I love your jars, is the first time that I see jars with that shape, they are original! I'm new to your blog and I love the way you share with us what you do. Just added to your list a wine bag I made, my usual way is to bring one wine gift bag like that ( with wine of course)at every place where we are invited in this Christmas period. I wish you a "Merry Christmas and a Happy New Year" Marisa. We did foodie gifts: several different jams and a delicious homemade pancake mix with directions.